Lio Piccolo By Bike: discover the excursions! One entire day riding along the Cavallino Treponti peninsula, admiring an ever-changing landscape. From rural villages to untouched natural environment, you’ll discover Cavallino Treponti from Ca’ Savio, del Prà square up to Lio Piccolo. Riding your bike, you’ll experience an adventurous day in Cavallino Treponti peninsula, accompanied by our expert guide. The trip begins from the little villages on the coast, then you’ll reach Ca’ Savio, its natural dunes and its coastal wood. After that part, you’ll cross the Pordelio canal through a bridge and enter Treponti town, until you reach, between canals and shallows, del Pra’ square, with its palazzo, the courtyard, the farmyard, the stables and the oratory. 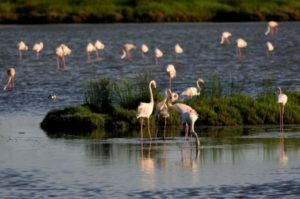 The Venetian Lagoon will be the very protagonist of the landscape: little paths along the fishing valleys reaches the solitary town of Lio Piccolo, in its quiet and peculiar natural environment. Here you’ll find rare birds, like pink flamingos. Your holidays as YOU want them ! Would you like to customise your tour or book another time? Do contact us ! Looking for other activities to do in Lio Piccolo and Cavallino Treporti? Discover all the activities suggested during summer on “Cose da fare a Lio Piccolo” (what to do in Lio Piccolo)! Reduced price: 5 EUR/pers for children from 6 to 12 y.o. Free for less than 6-y.o children. The renting of the bike costs 8 EUR/pers and will be paid on location. In case of cancellation up to 24 hours before the excursion, a 10% cancellation fee will be deducted. There is no refund in case of NO-SHOW which corresponds to a non-presence at the time and place where the experience takes place. Experience from da 1 to 8 people, held in Italian, English and German.